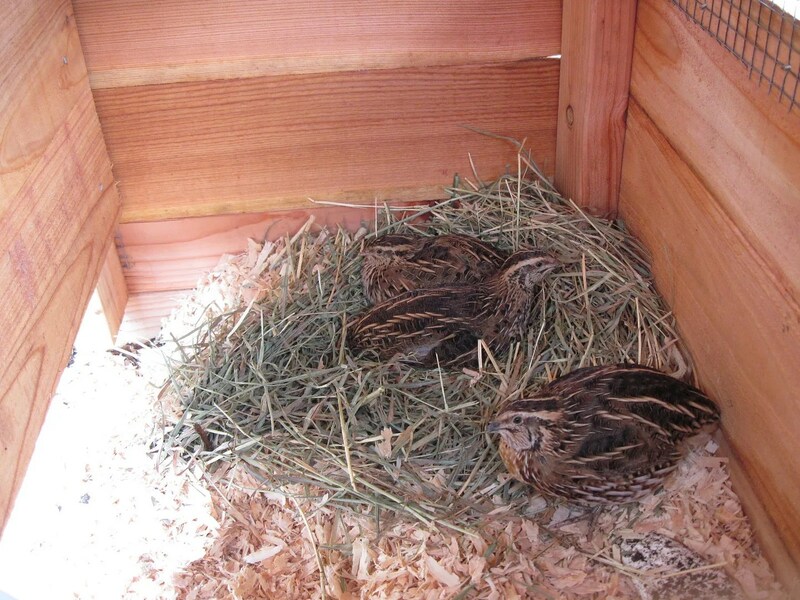 ← Schemes, and Also Cute Quails. Well, except for the roofing. 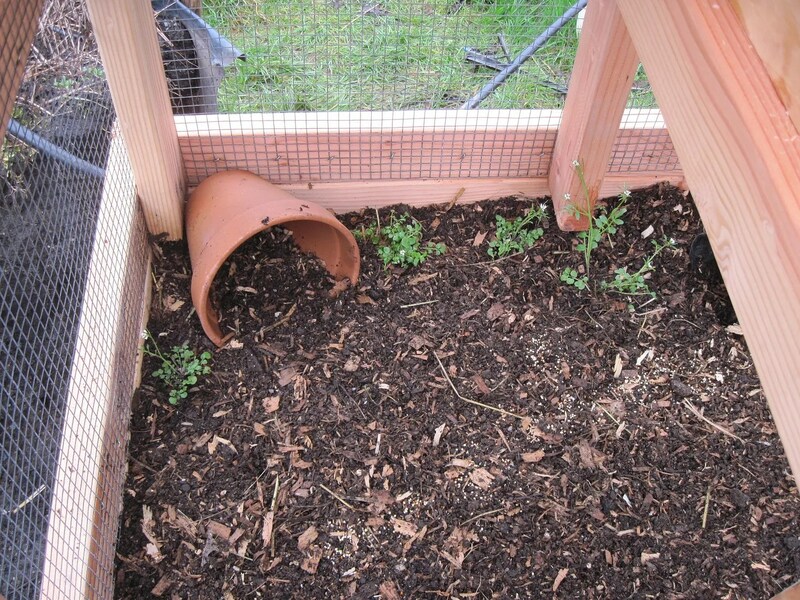 But it’s done enough, and the quail can move in! Since Loki’s future wives are not yet hatched, I moved Cinna and his girls inside so I could move Cinna’s coop to a new, more central location. I wasn’t sure how tame Cinna and the girls actually were, since I haven’t tried to catch them since they were chicks, but they were so nice. They stood still and just let me pick them up without any fuss at all. They’d been working really hard at composting the dirt from their former coop into lovely, rich earth, full of bugs and earthworms, and I didn’t want to deprive them of winning the rewards of their labor, so I put them temporarily into one of my cold frames. And then we dug out the dirt from their old coop and put it into the new one. Nice, lovely composted dirt! Despite having had quails living (and pooping) on it for around half a year, it didn’t smell. I would have loved to put it into my garden, but I gave it back to them, worms and all. I need to add some plants and little logs and things for them. The green you see is just a few edible weeds I “planted” for them. Which of course, they promptly dug out! The nest box area also has their food and water. They were quite enamored of their nest area, and spent quite a bit of time inside, arranging their hay. And then they all took a nap. The two little females snuggled up together, and Cinna on guard beside them. After the nap, they left me a tip. I hadn’t named the two females, because I couldn’t tell them apart. They are identical in looks. But having spent considerable time recently watching them, I’ve learned that they are quite different in personality. I’ve named them Mary and Martha, because they remind me of those Biblical sisters. Martha always vigorously doing what needs to be done (in this case digging for worms and uprooting plants), while Mary is contend to sit and learn. I also gave them some alfalfa seeds I had sprouted. That was a big hit. I’ll definitely continue doing that on a regular basis. I have one more quail coop to build, and then I’ll have the big coop with the green roof empty and available for my future Serama chickens. Now that I have this awesome incubator and brooder, I honestly want to hatch ALL THE EGGS. 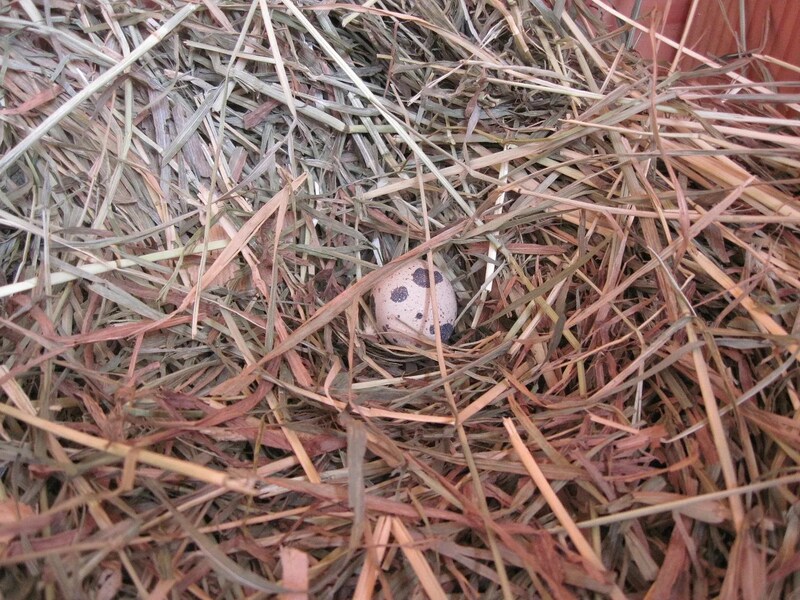 This entry was posted in quail and tagged coturnix quail, quail coop, raising quail naturally. Bookmark the permalink. I love the new coop. It is really nice for watching them – just the right height to pull a chair up to! It turned out great! I have a question about the coop. Is it attached to the cinder blocks? We need to get going on ours soon! It isn’t attached to the blocks. I did staple hardware cloth to the underside of the wood bottom, though. We have a rat problem in my city, so I’m always careful to keep all animal cages rat proof. I don’t want them attracted in to eat the quail food…and then maybe eating a few quail! I also made the cage so that the bottom frame (that has the dirt in it) is detachable from the top half. That way, if the moisture of the dirt rots the wood, I can replace that part easily without rebuilding the entire cage. I love your coop. Question for you (I’m just trying to get started in quail). Do the quail try to fly out when you open the lid? Or do you close them off in the nesting area before going in? They never have. They aren’t afraid of me, but they are extremely wary of the big scary world beyond their cage. They don’t want to leave their cage; I can actually open their door, then turn away without worrying about it. My quail really aren’t flyers, period. If they get scared, they freeze and crouch. One escaped out of my hands once when I was transporting it to a different pen, and it only flew down to the ground, then froze in terror. All I had to was pick it up. I used to keep their wings clipped, but now I don’t bother. That makes sense. It’s the first I’ve heard anyone mention wing clipping too. Thank you. I am so curious as to where you got your stock quail? Your posts are wonderful and you have lovely little birds! I’m in Washington state also. 🙂 Do you worry about Coryza from the chickens at all, or other chicken diseases? I see so many conflicting things on that. I read about the various diseases, but there was so much conflicting info, that I finally decided to just give it a go and see what happened. So far, there’s been zero sign of any problem among my poultry, and my friend who is also doing the same things has no problems either. I think it might be an issue if you overcrowd your birds, or other things that would contribute to disease issues. I don’t let the chickens or quail have direct contact with each other’s feces, though…I don’t use dirt from the chicken yard in the quail coops, for instance. I bought an incubator and shipped in eggs to get my stock, which was an adventure, since my first incubator was a piece of crap. What part of WA are you in? If you’re close enough to me, and want either hatching eggs or straight run baby quail, I might be able to help you out, once the quail start laying regularly again. Thank you for offering, I’m in Vancouver, WA. Which part are you in? 🙂 I wondered if maybe you got your Italians from James Marie Farms: http://www.jamesmariefarms.com/cqv-specialityClass-overview.html I don’t see a “Golden Italian” but an Italian and Italian Specked. Apparently people have been happy with the larger quail eggs from their Jumbo varieties. Yours sound so sweet and friendly! I love that. The disease issue is worrying but I haven’t met anyone other than two people on BYC that had issues, and I don’t think they were diagnosed by a veterinarian so possible speculation. I’m worried because I would love to let mine be in a special “quail tractor” just for during the day, only, for enrichment and so that they can get more bug protein in their diet. We’d do the deep litter method for their coop. But then, if I tractor them, they’d have contact with chicken feces. We don’t have enough yard to keep them separate from the chickens that way unless they’re cooped all the time. Do you think that worry is eliminated if the chickens are from NPIP-certified stock? Mine will be. My understanding is that some of these diseases are airborne, anyway, so I don’t really know what to do. The Merck manual didn’t seem to attribute Infectious Coryza symptoms in quail to be from chickens, instead it said that if they exhibit similar symptoms it’s from some other related disease, if I understood it correctly. One issue I’m faced with is having the hardest time finding (to buy locally) USDA Organic gamebird feed that will meet their protein requirements. Best I’ve found is Scratch & Peck Naturally Free Chick Starter, which is great and I like that brand as it’s local, but it’s only 20.5% protein. UC Davis’ gamebird manual said for optimum growth to “buy a game bird or turkey starter ration that contains 24 to 28 percent protein and to feed the chicks on that for the first 6 weeks. From 7 to 14 weeks of age, feed them on a game bird or turkey grower diet or a chicken starter diet that contains about 20 percent protein.” So the S&P chick starter may work for later, but I suppose not initially. Unrelated, but do you put apple cider vinegar in your quail’s water? I’ll be starting a worm bin and they could have some of that along with the chickens. We’ll be raising Icelandics. 🙂 Thanks for answering all my numerous questions! I hadn’t come across James Marie Farms before; I’m going to have to check into their eggs next time I need new stock! I think my “Golden Italians” are what they call plain “Italians”…maybe? Quail colors are a bit frustrating, because it seems like every person describes them by a different name. Mine are sweet, largely because I handled them a lot when they were babies, and would sleep in my hand. Now, they aren’t afraid of me, but they really don’t care to be touched. They will stand still and let me pick them up, which is nice if I need to capture them for some reason. The disease issue…if I were in your shoes, I would probably just do the tractor system and hope for the best. My personal feeling is that disease is much more an issue if your birds are unhealthy to begin with, and then if they are fed bad food, and kept in crowded, unnatural conditions. For instance, people say you should NEVER keep turkeys and chickens together, because the chickens will infect the turkeys with fatal Blackhead disease. I’ve read numerous blogs, though, where people have mixed poultry with no bad effects. It seems like most of the trouble comes from bad conditions and unhealthy birds, not the mixing itself. And even though my chickens and quail don’t actual run together, they are only separated by hardware cloth, and I wear the same clothes and shoes when I handle both, so if they were going to get infected, they definitely could. Knock on wood…no problems yet! I’d rather let my birds get out and live natural lives. I’ve only used Apple Cider Vinegar now and then, when I’ve had a poorly bird. I do plan to start adding it regularly – especially once I learned it also keeps algea from growing inside the water bottles. And I’ve enjoyed all your questions and comments! It’s always fun to meet another kindred soul – especially one that’s in the area! My email is middleearthfan@yahoo.com if you have more questions or just want to chat birds! I’m envious of your future Icelandics, btw. They sound like awesome chickens. I love your blog! I am thinking about keeping quail and want to take advantage of your experience. 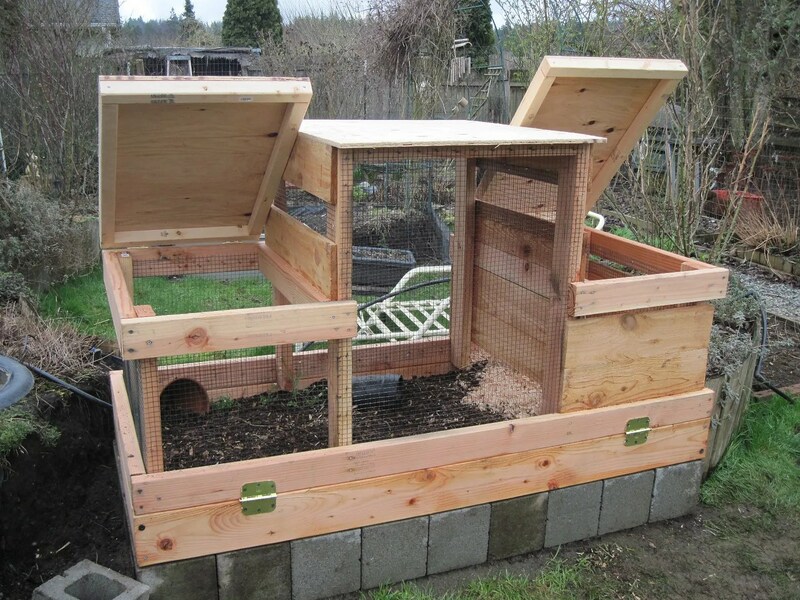 Have you posted the blueprints to your quail coops anywhere? 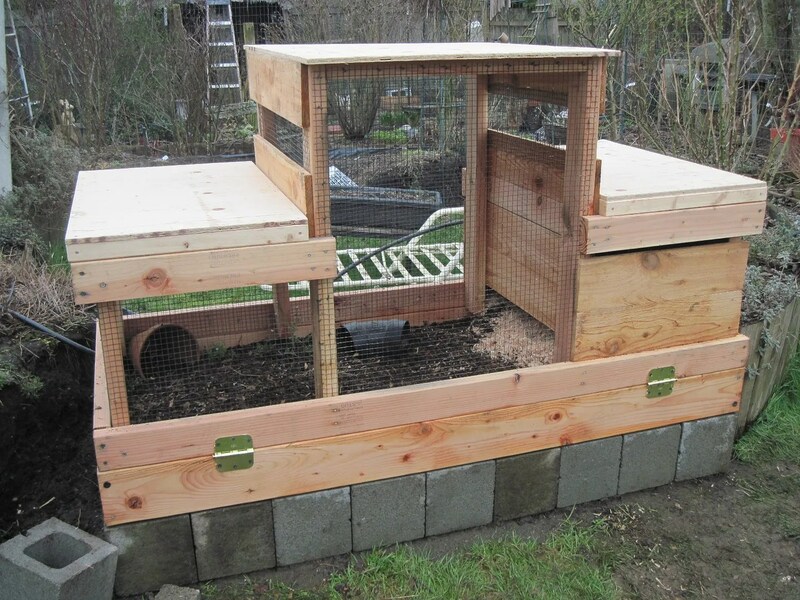 I am interested in particular in how you move your quail coop from garden bed to garden bed. Thanks! Thanks! Sorry, I don’t have blueprints of my coops posted anywhere – I don’t even *have* blueprints, period. I just built each one off the top of my head, from scratch. As for moving the coops, only one is moveable. I have it attached to the wood frame of the raised bed with a set of hinges and screws. When I want to move it, I just unscrew one half of the hinge, and lift the coop onto the other bed, and screw the hinge down again. It takes maybe five minutes? Obviously, you have to remove the quail first! Mine are tame enough that I can just reach in, grab them, and put them in a lidded box or basket while I’m moving the coop. Did that answer you question? Hi! We plan on getting our first quail soon. We are currently just figuring out logistics: how we will build their coop etc. I really like your setup. 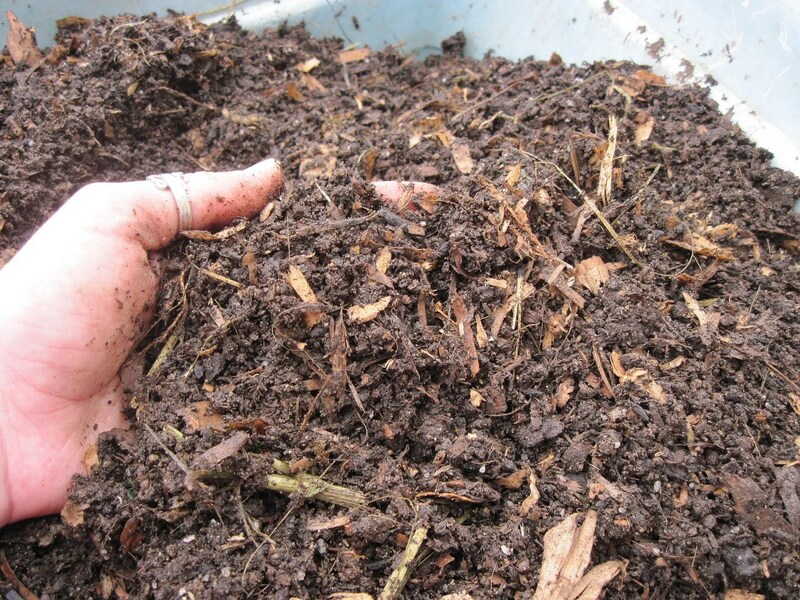 Did you use a specific kind of dirt in your setup (I’m just wondering if there is anything to avoid if buying soil…) and can you use any kind of wood chip, or is one mind better or worse than another? I use just ordinary garden dirt, it comes with bugs and worms included! If you buy it, avoid fillers like vermiculite that the quail might eat. For shavings, I use pine; I’ve heard that cedar isn’t good for animals. Good luck with your quail! What is the flower pot for? A hidey hole? I’ve seen a few people do that. Yes, it’s a hidey hole. Mine like to lay their eggs in it. So is the dirt like deep litter? Do you ever change it or add anything to it? It is similar to deep litter. I have, once, taken some compost out of it for the garden, but mostly I leave it alone. Usually the quail keep it dug up and turned over, but if it gets too hard for them, I go in with a trowel and help them out. 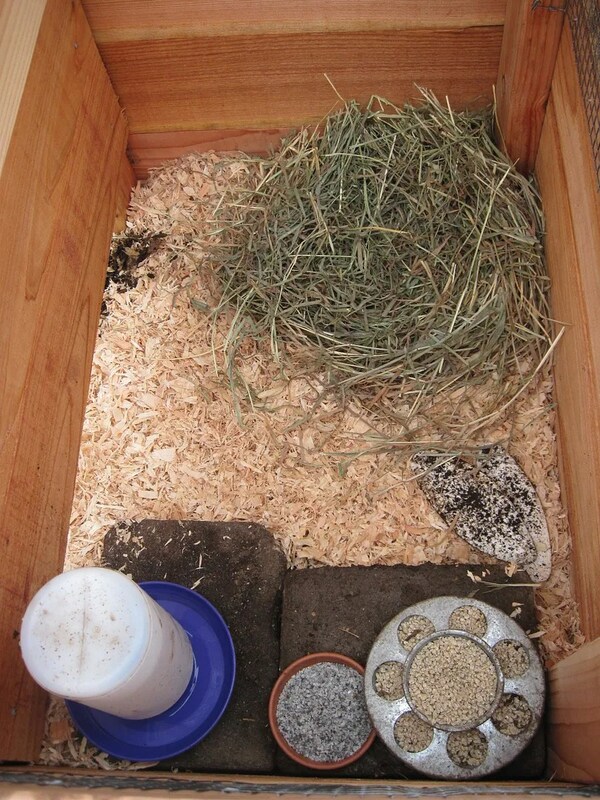 Otherwise, I just add some shavings or straw now and then for nesting in.